This page will guide you through the install process, and basic book setup process. 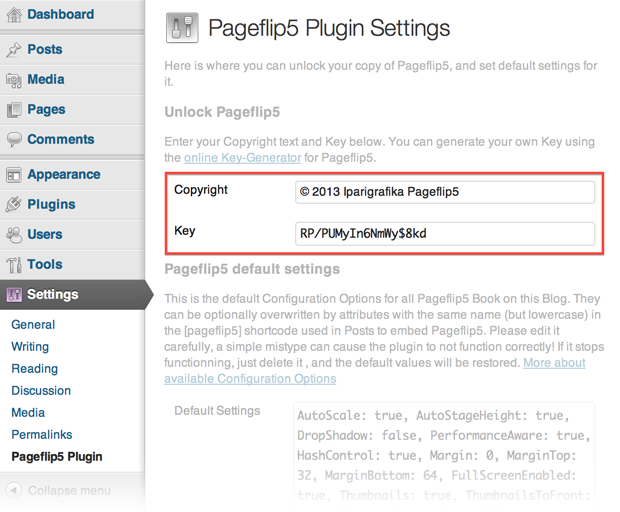 If you purchase a Pageflip5 license, your download package will contains the WordPress Plugin with pageflip5-min.js included. If you don't purchased a Pageflip5 license, then Get a license now! Generate Your own Key for Pageflip5 using the online Key Generator. You will be asked to enter your unique Pageflip5 License-Key, Allowed Domains, and a Copyright Text. Press the Generate Key button on the bottom of the page, then copy & paste the content of the Copyright Text, and the Key fields into your WordPress plugin settings page. 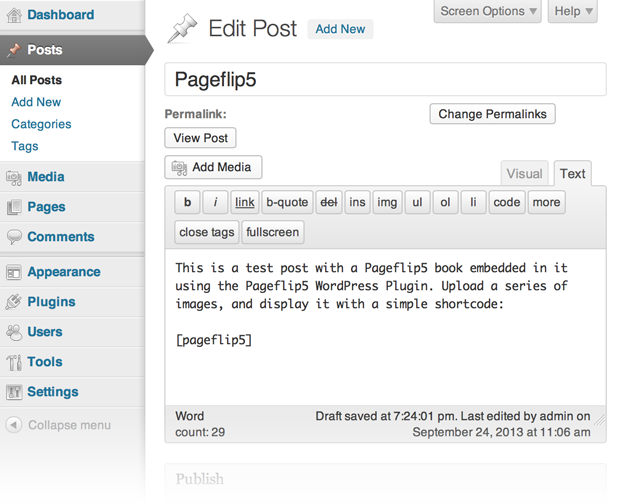 Save Changes, and you're ready to make Your own books on your WordPress blog. 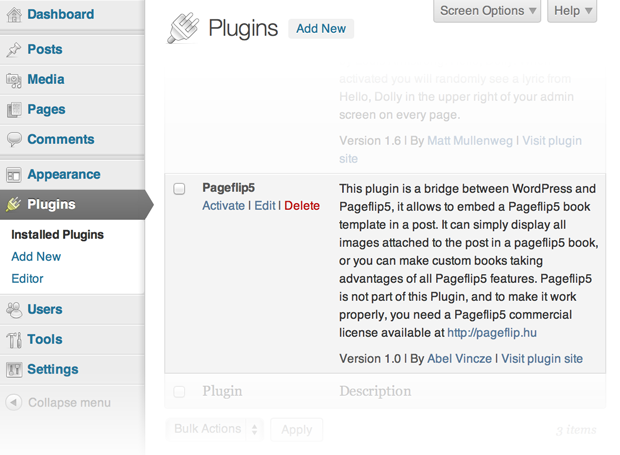 The Plugin Attributes are handled by the plugin, they aren't passed to the Pageflip5 engine. They are used, when multiple books are displayed on the same page. As only one Pageflip5 book can be shown on a web page, the hidden books can be opened by clicking on a link. ID of the book, it is also used in the URL hash generated by Pageflip5, and added as CSS class name to the book main parts in the DOM, helping styling the book. Used in book opening link. Adding a unique ID to the book helps deep linking in the book, even there is more books on the page. All Pageflip Config Attributes set in the shortcode will override the default Config Options set in the Plugins Setting page. Please note, that linking files this way will point to the root of the WordPress blog.